(Nanowerk News) Researchers at Swinburne University of Technology have discovered a new way to generate bright beams of coherent extreme UV radiation using a table-top setup that could be used to produce high resolution images of tiny structures at the nanoscale. “The ability to image nano-scale features with a conventional optical microscope is limited by the wavelength of the light used to illuminate the sample, Professor Lap van Dao, who led the research, said. 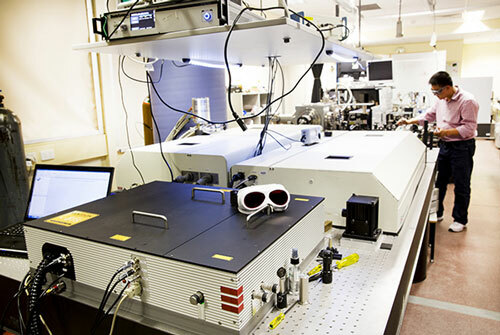 The new table-top system may offer a cost-effective and convenient alternative to large-scale, multi-million-dollar facilities such as synchrotrons or free-electron lasers, which, until now, were the only way to generate bright coherent beams of extreme UV radiation. The researchers from the Centre for Quantum and Optical Science used their table-top laser setup to illuminate a gas cell of argon with two intense beams of ultrashort laser pulses at different wavelengths. One beam generates ‘high-order harmonics’ in the extreme UV, while the effect of the second overlapping beam is to amplify the extreme UV radiation by a process known as optical parametric amplification. These bright coherent beams of extreme UV radiation will be used for high resolution imaging based on a ‘lensless’ imaging technique called coherent diffractive imaging, in which images are reconstructed by a computer. “This research paves the way for the generation of intense radiation at still shorter wavelengths and ultimately to apply coherent diffractive imaging techniques to nano-scale structures and to biological samples in the water window region (2-4 nanometres),” Emeritus Professor Peter Hannaford said. The new research has been published in the prestigious journal Nature Communications ("Perturbative optical parametric amplification in the extreme ultraviolet").